If you are trying to eat the rainbow in fruits and vegetables (as they say you should, every day, to get the nutritents and vitamins you need), yellow is a tough color to find. There’s corn, but that’s basically a carb and probably doesn’t count. There are yellow peppers, but they’re usually more expensive than green peppers (and really, do they taste any different?) so I’m usually unlikely to buy them unless they’re on sale (enough so to be cheaper than green peppers). There are a few yellow fruit to choose from – pineapple, bananas, lemons – but if you’re looking for a yellow vegetable, you’re pretty much stuck with summer squash. They probably didn’t take this into consideration when they decided to encourage eating the rainbow. I’ve always thought of summer squash as the lesser relative of zucchini. Zucchini is green, which, in my book quates to a higher status in the vegetable hierarchy. Summer squash has a high water content (apparently right up there with cucumbers) meaning it gets mushy fast. It also has a waxy consistency (has anyone else noticed that?). So, whenever faced with an option to use summer squash or zucchini, I choose zucchini. It’s not that I don’t like summer squash, I just feel like zucchini is better. However, “Oh, I’m sorry, I prefer zucchini” was not an option last week, when I received five (yes, five) whole summer squash in my box. 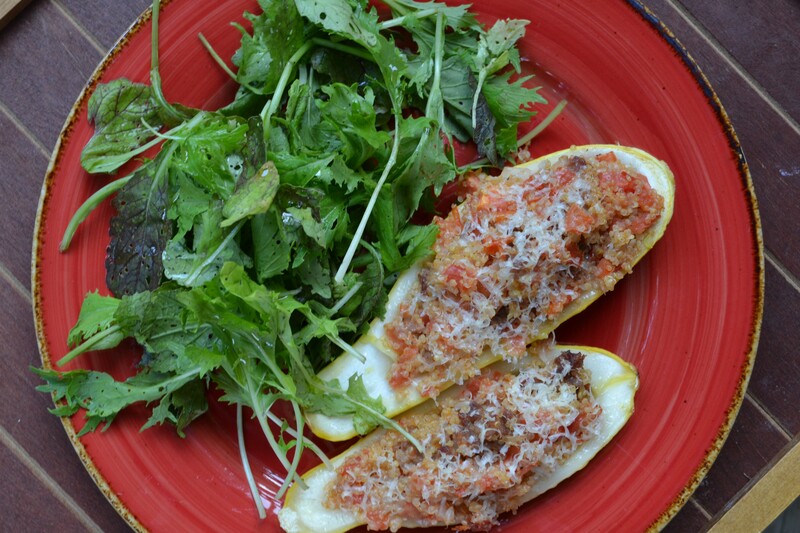 Enter this stuffed summer squash recipe. Summer squash, I’ll give you another chance. 4 servings. Serving size: 1 whole squash. Per Serving: $3.11, 284 calories, 13g fat, 30g carbs, 16g protein. Cook 1/2 cup quinoa according to package direction. Preheat oven to 350 degrees Fahrenheit. Put 4 medium sized squash in a sauce pan and fill halfway with water. Bring to a simmer and boil for 6 minutes, then set aside to cool. Saute 1/2 diced onion in 1 tablespoon olive oil. Add 2 Italian sausage without the casing and cook until browned. Add 3 diced roma tomatoes and 2 cloves minced garlic. Cook until tomatoes are soft and remove from heat. Add quinoa, salt, and pepper. Cut squash in half lengthwise and spoon out seeds, then place upside down on a paper towel to drain. Fill with stuffing and top with 1/4 cup freshly grated parmesan cheese. Bake in oven for 25 minutes. If you like this recipe and feel adventourous, you could use the same stuffing in different vegetables – try green peppers, tomatoes, zucchini, or mushrooms. All you need to do is adjust the cooking time based on the density of the vegetable. For example, tomatoes are more delicate and require less time to cook (so don’t par cook them to begin with) and keep an eye on them as they bake in the oven. This entry was posted in Dinner and tagged quinoa, sausage, squash, summer squash, yellow squash by cooklikekayla. Bookmark the permalink.